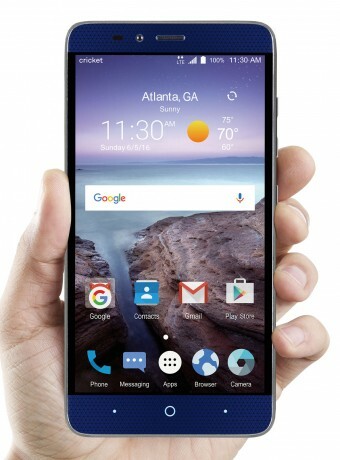 ZTE today announced the Grand X Max 2 for Cricket Wireless, an inexpensive handset that includes two rear cameras. The phone boasts a 6-inch full HD display protected by Gorilla Glass 3. The camera ensemble features 13- and 2-megapixel sensors on the back that ZTE says capture more detailed images. The camera boasts features such as bokeh, panorama, multiexposure, and manual modes. The front camera has a 5-megapixel sensor; both cameras can capture full HD video. The Grand X Max 2 is powered by a 1.5 GHz octa-core Snapdragon processor and ships with 2 GB of RAM and 16 GB of internal storage. The phone adopts the USB Type-C connector and the 3,400mAh battery supports Quick Charge 2.0 for rapid charging. Other hardware features include LTE, GPS, memory card support, and standard headphone jack. ZTE loaded Google's Android 6.0 Marshmallow operating system on the device, which includes a variety of Google and Cricket apps and services, such as Deezer and Dolby Audio. The ZTE Grand X Max 2 is available at Cricket stores starting today for $199.99. ZTE is looking to take the title of King Phablet with the Grand X Max 2 for Cricket Wireless. This enormous handset features a 6-inch screen, 3,400mAh battery, and Android 6.0 Marshmallow. ZTE today announced the Grand X 4, a $130 phablet, for Cricket Wireless. The device features a 5.5-inch 720p HD screen, Snapdragon 412 processor, 2 GB of RAM, and 16 GB of storage.